Today I'm posting some pictures that I've taken this fall that make me feel happy. I swear I'm going through some kind of a funky Chronic Fatigue Syndrome or something lately, so I need a little sunshine today! I tried! I was going to do more but the frosting tube's tip broke and severely limited my decorating options after that. That's my excuse anyway. 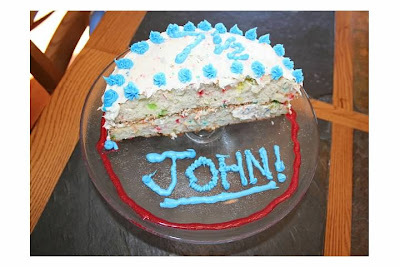 But I guess the most important thing is that John liked it! 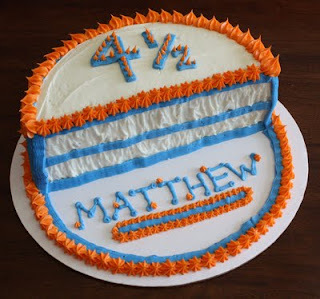 -My lack of talent when it comes to designing and decorating cakes is why I almost always have birthday cakes specially made for my boys. 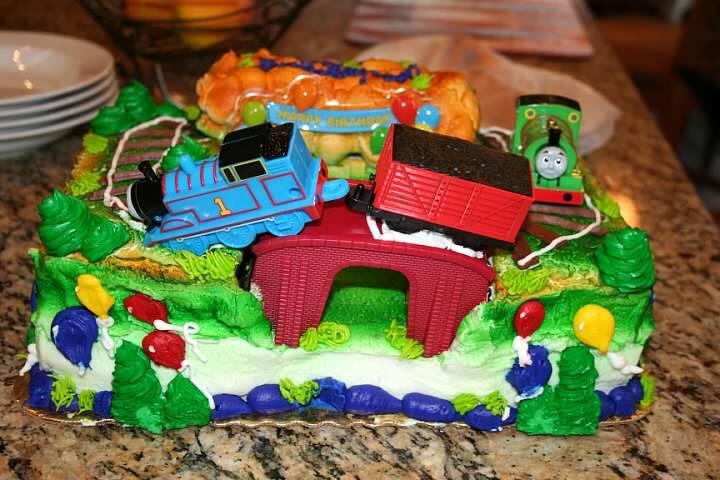 A few weeks before Sam's birthday in September, we saw a Thomas the Tank Engine cake at the grocery store and he left the store screaming and crying because he wanted that cake. So I ordered it for him and a few weeks later he had it for his birthday. But dang, that cake was expensive! And the display cake was cuter than the actual cake we got. 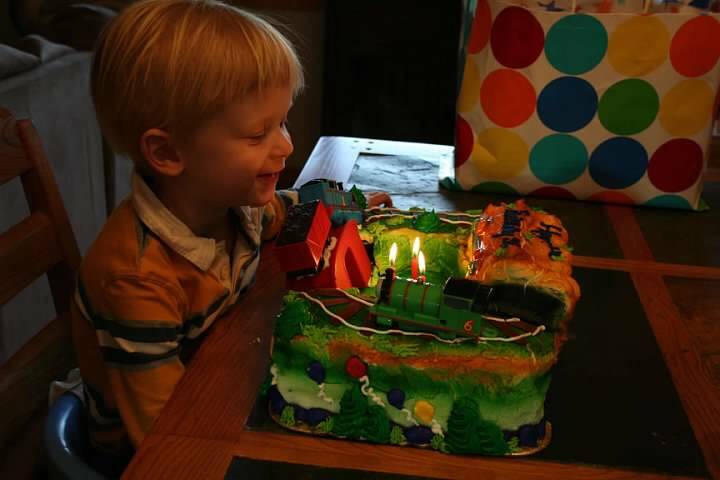 But again, the most important thing was that Sam was very happy with it! -Speaking of Sam's birthday, here are a couple of other pictures from that fun day. 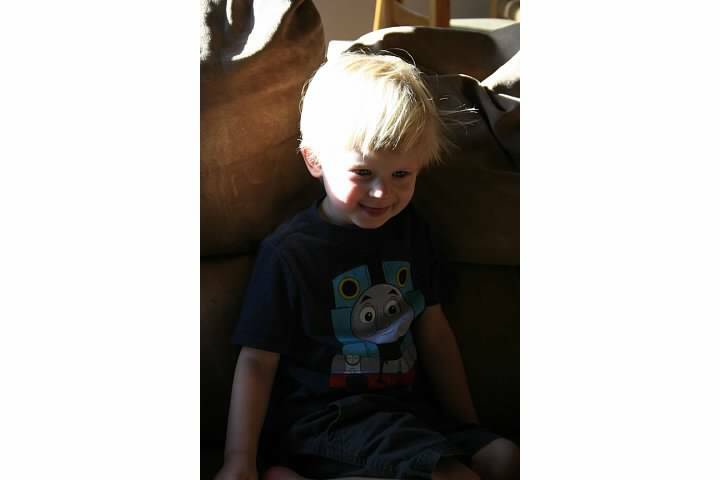 I can't believe he's three now! In the morning with the presents. 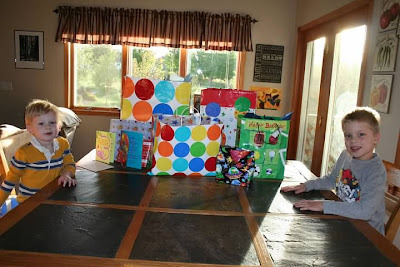 One of our birthday traditions, passed down from my own family, is that you can choose one present to open in the morning. I let Sam open his biggest present because then he could spend the day playing with it, which he did. It was Bucky, the ship from Jake and the Neverland Pirates. I love the expression on his face when John was showing him all the cool things it can do. 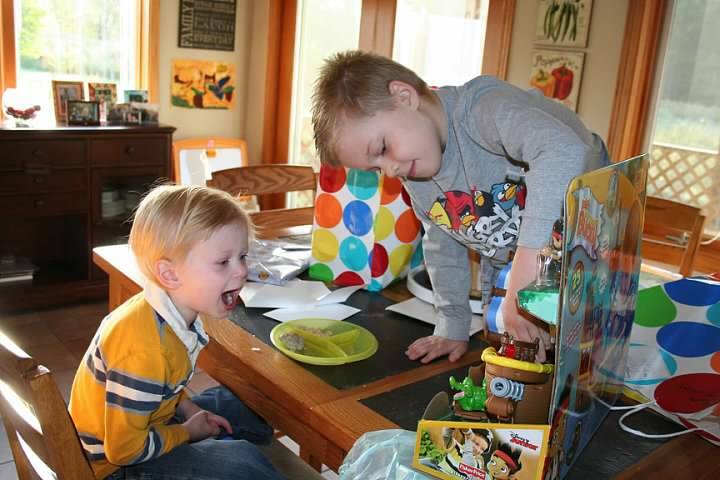 So priceless! -September was a big month for Sam. 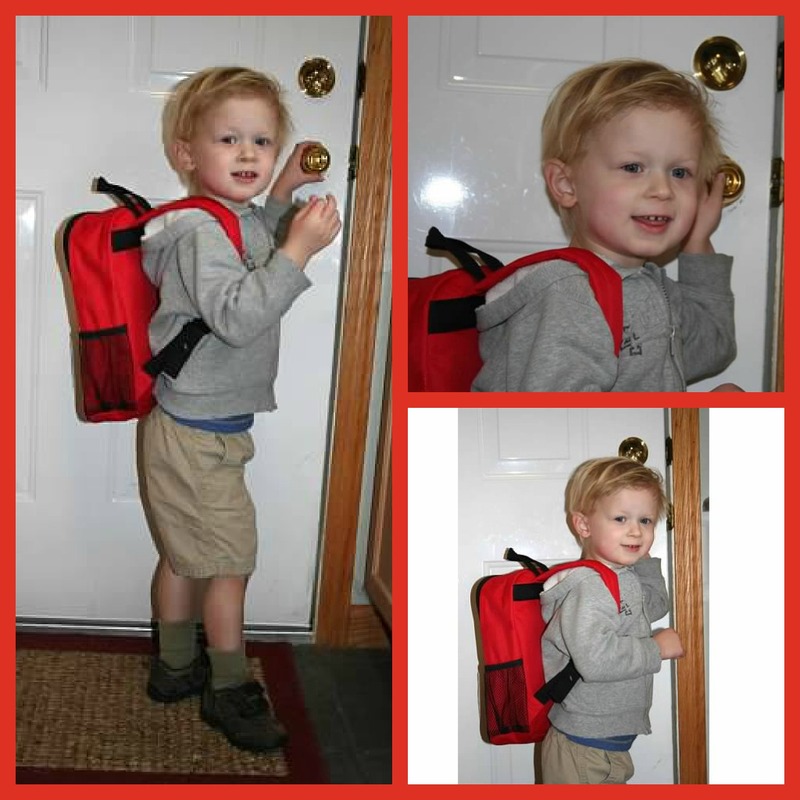 He started preschool about a week after his birthday. He was excited to go, and I'm happy to report that he LOVES it! Here he is on his first day right before we left. He was eager to get going and he did great that day and all the days since. I was and am very proud of him. -I hope you're not all Sammed-out yet. 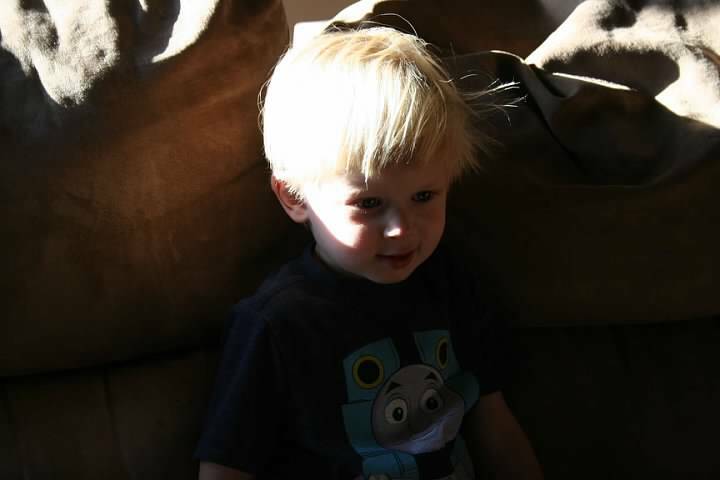 Here he is sitting in the sunshine while watching his favorite show, Little Einsteins. I love how the sun illuminates his hair and makes it look like spun gold. He's my little angel boy! -Okay, just one more Sam thing! (John is going to get an inferiority complex if he sees this post!) 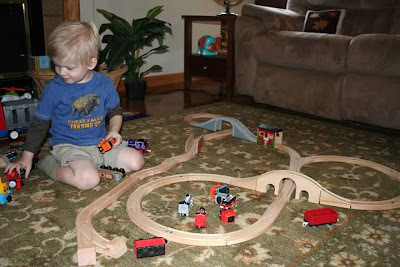 Sam is good at building train tracks, and I like watching him have fun as he creates and plays. 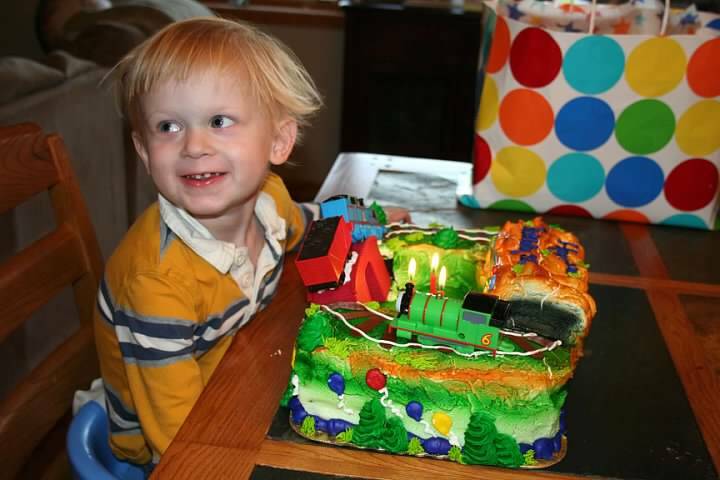 Trains have definitely been a good investment for this little boy. 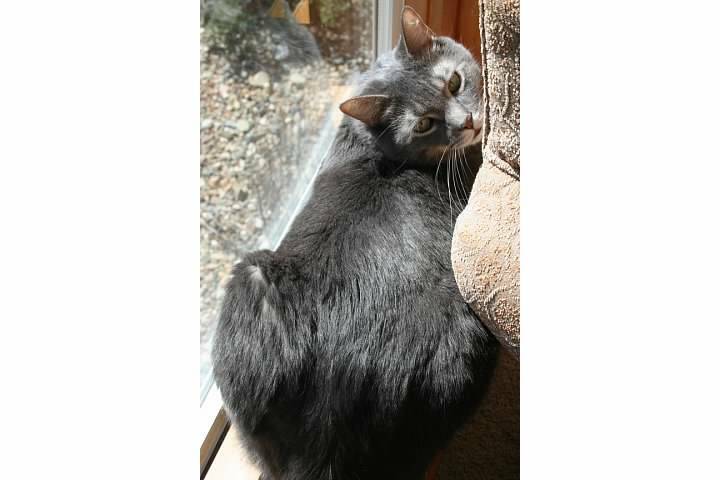 -My cat Brody makes me happy. I was never really a cat person until he came along. I like it when he lies in the sun and then I pet him and his fur is so nice and warm and silky-soft. One of the things I love about Brody is that he doesn't always like me, so he'll often run away from me, which makes me chase him around until I can catch him and hold him and cuddle him close, and he meows and threateningly stretches his claws out at me in protest. I love it! Peter thinks I torture him but I know Brody likes it (although sometimes he does get really ticked at me). Yes, Brody makes me a crazy cat lady. But he makes me a happy crazy cat lady. 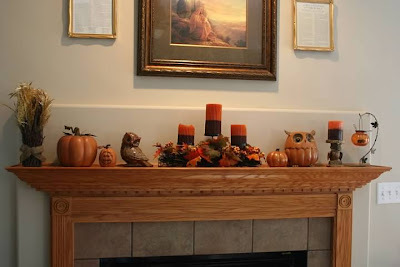 -This was our fall mantel this year. This is without the Halloween things on it that I put up in October. 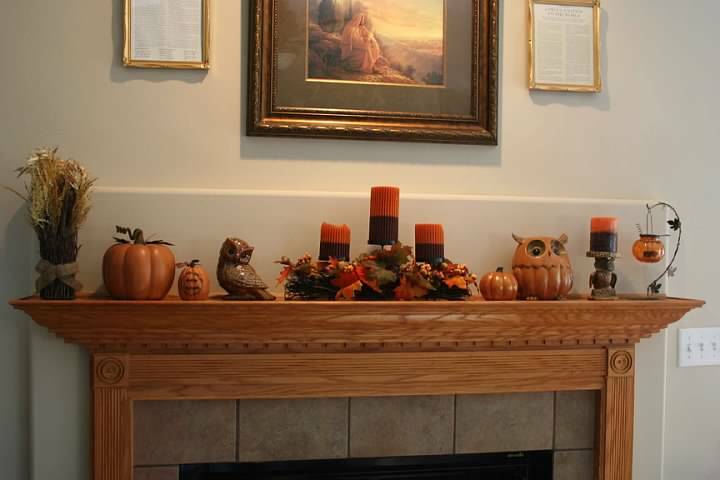 I love that pumpkin owl. You may already know this but I'm on my way to being a crazy owl lady too. Well, putting together this post must have been therapeutic because I'm feeling better now. It's nice and so beneficial to re-live the happy moments of life!